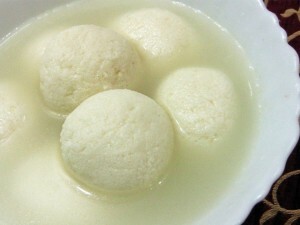 Rasgulla: Rasgulla is a cheese-based, syrupy dessert popular in the Indian subcontinent and Mauritius. Rasgulla is made from ball shaped dumplings of chhena (an Indian cottage cheese) and semolina dough, cooked in light syrup made of sugar. This is done until the syrup permeates the dumplings. In the coastal city of Puri in Odisha, the rasgulla has been the traditional offering (bhog) to the Hindu goddess Lakshmi. Boil milk, in a deep bottomed vessel, on medium heat. Add in 1 tablespoon of lemon juice. Mix well, till the milk curdles. Add in the remaining lemon juice. Mix well, till the milk is completely separated into curds and whey. Strain the curds in a cheese cloth. Wash the strained curds with fresh water, to remove the sourness of the lemon. Bring the edges of the cloth up and tie it together. Squeeze the excess water and hang the cloth above the sink for 30 minutes. Chenna for rasgulla has been prepared. Knead the chenna, to make smooth pliable dough. Knead well, for at least 10 minutes. Divide the dough into 10-15 equal sized portions. Shape each dough portion into a smooth round ball. In a deep bottomed wide vessel, mix sugar and water. Boil the sugar-water mixture on medium heat, till the sugar melts. Add in the chenna balls and green cardamom powder. Cove the vessel with a lid and cook for 15-20 minutes, opening the lid, every 7-8 minutes. Remove the cooked chenna balls (rasgullas) from heat and let them come down to the room temperature. Rasgulla are ready to be served. Serve chilled along with a spoon of sugar syrup. If you have any queries regarding the Rasgulla recipe, please leave a comment.